We recently received an invitation from Julz (Juliette Rainfall) to visit the latest region design she and her SL partner, Leaf (Peyton Darmoset) have put together. As the people responsible for creating the outstanding region designs of Cold Ash (read more here), Erebos Harbor (read more here) and Cloudbreak (read here), among others, we were keen to see their latest work. Unlike most of their previous designs, Flourish is a commercial region, designed to be the home of the Flourish Studio and Salon S2 brands. However, this Full region is also very photogenic, as one would expect from one of Leaf’s designs. Surrounded by dusty hills and mountains, the region is presented as a rugged desert setting, centred on a deep-sided lake, its shores largely cliff-like walls. Roads appear to cut through the landscape, passing across region and sim surround alike. One of theses point “into” the region and to the grounds of Flourish Studio, the other winds its way up the southern foothills to the Salon S2 store (which at the time of our visit had yet to be outfitted). Desert it might be, but there is a lot going on here. The stepped foothills on the southern side of the region offer space to climb and explore alongside the Salon S2 building, the landscape here a mix of bare rock, scrub grass, cacti, creosote bushes and wild shrubs. Within it sit a water run-off and evidence of some old workings of some description. Wooden steps offer a route up and down the tiered rocks of the hills, with a hole in the fence around Flourish Studio – designed to resemble an outdoor market – inviting explorers into the store at it sits in the north-east corner of the region. Follow the road west from here and it will lead you past a somewhat run-down motel, faced by a bus stop / fuelling point across the road, while away to the north the shadowy forms of high-rise buildings break the horizon, indicating the presence of a distant city. Might this be Reno or Las Vegas or somewhere else? That’s up to you to decide. Alongside the bus stop is something of an artistic statement: an old outside broadcast van, its satellite dish pointing vacantly to the hills as it forms a backdrop to an array of old televisions, the screens of which have been painted with a variety of slogans, some of them with a lean perhaps towards political comments. Close to this statement, a sandy path leads away from the road and between the rocks and boulders to point the way yo the top of the cliffs of the lake. Here’s under a large canvas awning, sits an events stage, the flat rock between it and the waters below offering room to dance, and a wooden platform built out from the cliff edge a place to sit. The the lake is fed by a tumbling waterfall, while narrow ribbons or sun-baked sand seem t0 offer narrow waterside beaches north and south, each reached by a path of hard-packed and parched sand. More art can be found off to the west, along the road winding up to the Salon S2 store. Here, next to neat lines of solar arrays as they capture the Sun’s like, stand three large female torsos, giant mannequins, on which have been painted the truism Life goes on. All of this presents a striking region with plenty of opportunities for exploration and photography, nicely rounded-off by an ambient soundscape. It may seem a little unfair presenting two reviews of exhibitions at the same gallery space in such short order, but the fact is the Itakos Project, curated by Akim Alonzo, is currently hosting exhibitions by Awesome Fallen and Akim himself which I personally feel should not be missed. Having covered Awesome’s Simply Dreaming just a day ago (see Awesome Fallen at the Itakos Project in Second Life), with this piece, I’m diving into the what might be referred to as “an exhibition of two halves”, both of which feature collections of Akim’s own work. Ansel Adam’s words have been the foundation of Akim’s approach to photography, and of the Itakos Project as a whole – and this is clearly demonstrated in both of the displays of art he has on display within the gallery at the time of our visits. Split between the gallery’s entrance level and the floor above, and occupying the Black Pavilion area, Water is a collection of 12 images focused on the titular subject. However, these are not simply studies of seascapes, coasts or similar. Rather, they are examinations of our complex relationship with water. We are conceived into water, life came from water, we are water; it both defines us and stands as something of a metaphorical image of human life and relationships, all of which Akim sums up in his liner notes on the exhibition. We are Water and we can not live without it. Sometimes we are like islands lost in the sea, or we float in lush archipelagos full of life. Water brings with it the meaning of survival, it is the immaterial substance of the flowing time, it is the depth of the human soul, of the vital emotions, of joy and fear, fury and tranquillity, of solitude and of love. Water moves me, I am Water. Thus, through this mix of monochrome and soft colour images we are offered the most stunning of image poems, each of which tells something of that complex relationship. These are pieces of such depth and narrative, they cannot be taken at a single glance; time is required to fully absorb their beauty and hear their myriad whispers. But that said, even looked a briefly, each speaks volumes about Akim’s eye and mind as a photographer; there is little doubting each piece has been influenced by the full breadth and depth of his artistry and all that has influenced it. These photos are loosely based on the cult movie The Matrix, which I loved a lot. A metaphor for a world of people trapped in a simulated, virtual reality that has many aspects in common with the Second Life world. So I imagined, listening to the Matrix soundtrack, avatars and life scenes in second life revealed in their intrinsic background network … of which we avatars do not realise. So it is that we are presented with nine images, again rich in metaphor and narrative. Framed by the ideas of the movies, as given form by the soundtracks, they also encompass an observer’s view of Second life coupled with a user’s innate understanding of the platform, with broader influences such as dream echoes and, stirred into the mix. As with Water, these are pieces rich in story and interpretation. Within them lie questions of reality and identity, and the riddle of worlds within worlds – the Chinese Boxes to which Akim refers – which not only extend inwards through the images, but also outwards to encompass each of us as we view them. In this, the reference to the Matrix is taken a stage further: not only are these images an interpretation of the films as layered within the virtual realm of Second Life – they actually reflect the central idea of the film: that were are all in fact unwittingly operating within a virtual realm. We are thus as much a part of each of these images, a further layer, if you will, that is observed from somewhere beyond us, as much as we are observers of each image. However, there is something else here as well; a more innate statement on our relationship with Second Life itself. Within these pictures is a subtle reminder that, no matter how hard we might try to distance self from character within SL; no matter what the roles we play in-world, the backstories we build, the fact remains that facets of our own natures, our own identities, will inevitably be impinged on those characters; they are, inevitably, and by their very nature, a projection of self into the virtual. What’s more, their daily encounters and experiences within the virtual realm inevitably reflect and inform upon our physical selves. We have a genuinely visceral intertwining between the “real” and the “virtual”. Together or individually, Water and The Matrix are two absorbing, evocative and engaging selections of art by a master photographer, artist and storyteller. 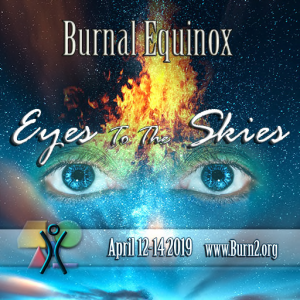 The Burn2 Burnal Exquinox event, which will run through until Sunday, April 14th, is now open. This is the traditional Burn2 event held midway between the annual October “big Burn” events year-by-year. For 2019, the theme of the event is Eyes to the Skies. Tied in with the annual global Yuri’s Night event, it is a celebration of space, “the final frontier” (or “great beyond”) and all that goes with it – science, mysticism and more. The weekend kicked-off on Friday, April 12th, courtesy of a live set of electronic music by Hao Zaytsev, and the marking of Yuri’s Night. This is an annual celebration of the first human flight in to space, completed by cosmonaut Yuri Alekseyevich Gagarin. He lifted-off from from Baikonur Cosmodrome atop his Vostok 1 booster on April 12th 1961 to become not only the first human to reach space, but the first to orbit the Earth in a flight lasting 108 minutes. On his return, he actually completely his flight via parachute, the mission calling for him to eject from the capsule prior to landing. Since 2011, the date of his flight has been celebrated as the “World’s Space Party”. Gagarin’s flight is marked on the Playa by a model of his Vostok K rocket, steaming with vented gasses as if awaiting launch, the Vostok 1 capsule sitting within its launch shroud sitting atop the rocket. It is just one of a number of installations both on the ground and in the air directly over the Playa awaiting exploration, which celebrate space flight, astronomy, science fiction, extraterrestrials, and more. Burn/Fire Dancers, Sunday, April 14th, 10:00 and 16:00 SLT. Burn2 Fashionistas, Sunday, April 14th, 14:00 SLT. DRUM, Sunday, April 14th, 15:00 SLT. And there will be live performers and DJ sets through both days. The event closes at 23:00 SLT on Sunday, April 13th. BURN2 is an extension of the Burning Man festival and community into the world of Second Life. It is an officially sanctioned Burning Man regional event, and the only virtual world event out of more than 100 real world Regional groups and the only regional event allowed to burn the man. The BURN2 Team operates events year around, culminating in an annual major festival of community, art and fire in the fall – a virtual echo of Burning Man itself.